The record is made up of 1 map. It was created in Jun 1915. It was written in English. The original is part of the British Library: India Office The department of the British Government to which the Government of India reported between 1858 and 1947. The successor to the Court of Directors. Records and Private Papers. General Staff India. S.D.O. No. 1251, June, 1915. Title continues: ‘To Accompany General Fry’s Report vide Page 7’. 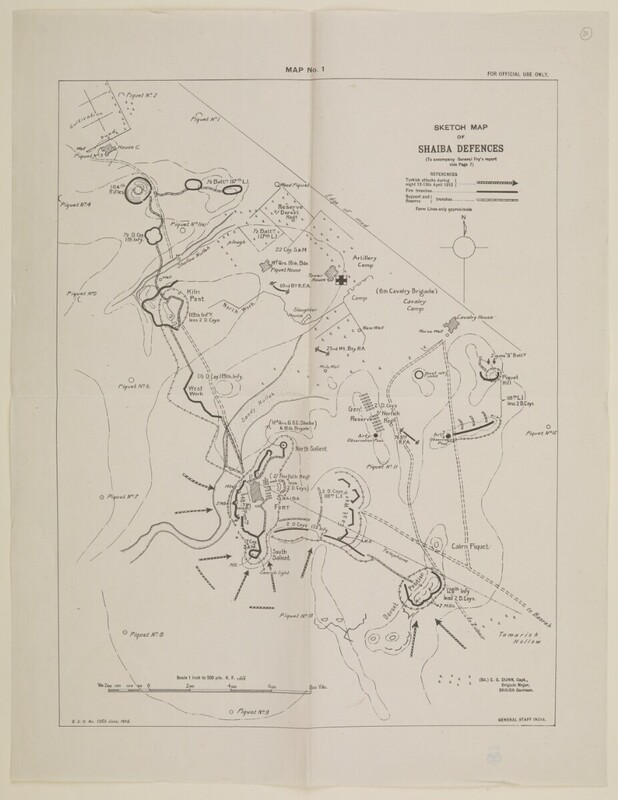 Map of Shaiba and vicinity produced to illustrate the movements of Turkish military forces on the night 12-13th April 1915. Shows the location of various brigades with positions of fire, support and reserve trenches indicated by symbols and explained in a key at the upper right-hand corner. Bottom right hand corner: ‘(Sd.) E.G. Dunn, Captain, Brigade Major, Shaiba Garrison’. Marked ‘For Official Use Only’.